← Gamer Crash at PAX East! Posted on April 7, 2012	by Derek "Gamer Crash"
Enjoy destroying Lego houses like Godzilla loose in New York? Wreckateer will certainly appeal to those destructive tendencies. I’m going to be honest here and admit that I’ve only just recently heard about this title. It’s a Kinect only game that mixes elements from that Wii game, Boom Blox, with Angry Birds. Oh yeah, and it has a good helping of the aftertouch feature from a little racing game called Burnout. Intrigued? Good, keep reading. I got some hands on time with the game and Iron Galaxy’s own Dave Lang was also on hand to help me learn the basics. You play as a knight who’s been contracted by the king to destroy castles around the land which have become infested with these green troll like creatures. You have a giant ballista and multiple types of projectiles to cause as much damage as possible. The game is score based so after you use up all of your shots, you’ll earn a Bronze, Silver, or Gold medal and a total score. Controlling the game is very easy as you clasp your hands together and step back to pull the lever back. Move your arms left and right to aim and fling you arms apart to launch the projectile. While in the air, you can use your hands to swipe at the ball putting spin on it or doing things like pushing it up or down. It’s very easy and the Kinect picked up on my motions very well. You’ll also get different shots like a Glider Ball which you can glide like a plane, a spread shot which breaks into 4 little balls, and a bomb shot which…well…explodes. I also noticed a sort of medal system in the game for doing specific things like hitting a troll in the face or setting of three sticks of dynamite in one shot. There’s nothing quite like seeing a slow motion camera angle of a projectile ripping through a castle wall and seeing it tumble to the ground. 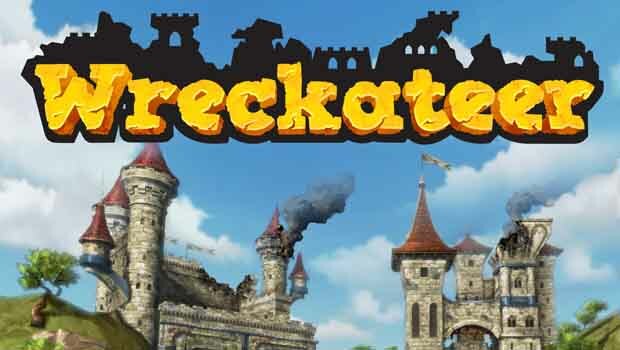 Wreckateer is coming fully loaded with 60+ levels and leaderboard support as well. I was really pleasantly surprised by the title and look forward to seeing it again this summer when it’s released on Xbox Live. This entry was posted in Opinion, PAX East 12 and tagged games, Opinion, previews, Xbox. Bookmark the permalink.